Welcome to Kavio’s Official Blog. - Basics to Fashion Clothing & Apparel. : Fun Sublimation Burnout Tees for Girls! Fun Sublimation Burnout Tees for Girls! Just in case you missed us at the ISS Decorated Apparel Show in Atlantic City last weekend, you can catch us in Minneapolis and Chicagoland for the Dax Expo! Come by and check out our latest style additions to our Girls Collection. We've just added new and fun sublimation designs for our burnout tees for girls, just in time for Spring and Summer! 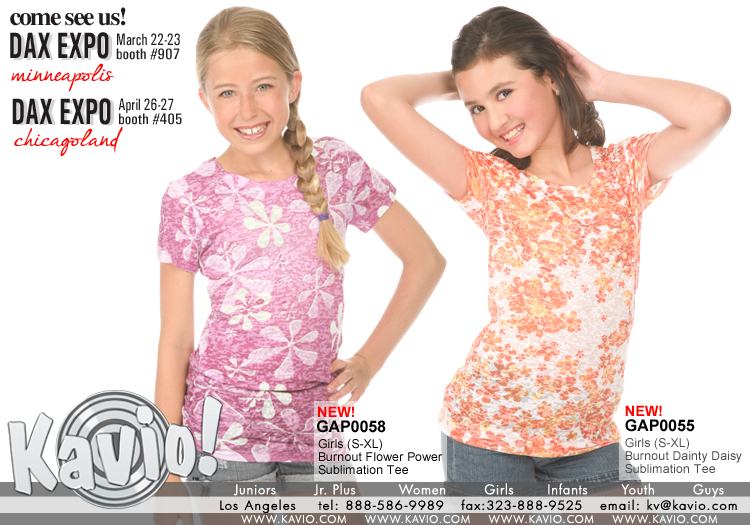 GAP0058 - our girls burnout crew neck sublimation tee is a fun and fashionable top featuring a "flower power"design. Made of 60/40 cotton/poly, this burnout tee for girls from Kavio! offers an ultra-soft touch and a comfortable sheer feel. Pair it with a tank top underneath for a layered look, it's perfect to wear with jean shorts for a fun summer look. Available in 2 fashionable colors Peach and Violet, sizes S-XL. GAP0055 - our girls burnout crew neck sublimation tee is also another fun top featuring a "dainty daisy" design covered in cute daisies all over the shirt. It's made of 60/40 cotton/poly, this burnout tee for girls offers an ultra soft touch and comfortable sheer feel. Cute for any spring time, summer time style, this fashionable girls burnout top goes great layered with any shorts for a playful look! Available in Tangerine sizes S-XL. Also available for Women's sizes S-XL.